Are you meeting your company's fiduciary duty regarding 401(k) plans? Many growing small businesses may not realize all the duties that go with sponsoring a 401(k) plan, particularly the personal responsibility that company leaders assume as fiduciaries of the plan. One of those key fiduciary responsibilities is having an audit conducted by a qualified independent accountant once the 401(k) plan reaches 120 participants. An important word there is “qualified.” A 2015 study by the Department of Labor (DOL) found serious problems in 40 percent of audits, which should be of concern to fiduciaries since it’s their responsibility to select a qualified independent accountant. Audits must be completed seven months after the end of the month the plan year ends, with an option to extend the deadline for two and a half months. For example, if you have a calendar year-end plan (Dec. 31), audits must be completed by July 31 of the following year, with an option to extend through Oct. 15. Compliance. To verify the plan is operating in compliance with DOL and Internal Revenue Service (IRS) regulations, as well as with the plan document. Financial reporting. To determine the accuracy of the financial information as reported on Form 5500 and plan financial statements (including required disclosures). How do plan fiduciaries act in the interest of plan participants while protecting themselves from liability? 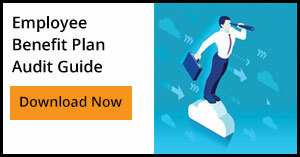 Plan sponsors should implement the following best practices to ensure the fiduciaries of the plan are acting in the participants’ best interest and are performing the duties required by law. Form a 401(k) administrative committee. It should be composed of senior-level company leaders who have insight into the operations of the plan. For example, the owner of the company, the heads of finance, human resources and benefits as well as in-house legal counsel may be good choices to serve on the committee. Hold regular meetings and retain minutes. Develop and follow an investment policy. An investment policy is a road map documenting which types of investments will be offered as options in a plan. An investment policy will help the committee identify which options are performing within acceptable benchmarks and which should be replaced with similar, better performing investment options. Review administrative fees being charged to the plan for reasonableness. Many plan sponsors believe the administration of a 401(k) plan is free, or close to free, because they are not writing many checks for plan record-keeping services. In reality, all 401(k) plans cost money to administer, and most of the fees are “hidden” within the investment returns of the plan that are paid by participants who earn those returns. Consider an outside investment advisor. Plans sponsors overwhelmed by these tasks can employ the help of independent investment advisors who can perform some, if not all, of the above functions. If the plan is not being operated in accordance with the provisions of the plan document, then the plan and the sponsor have a compliance issue that will likely need to be corrected. The plan will likely need to comply with IRS and DOL regulations as well. Below are some of the more common plan issues that regulators focus on. Plan eligibility practices. Very often there are some employees allowed to participate in the plan who were defined as ineligible in the plan document. The opposite can also be true. The most common cause of these errors is assuming employees eligible for health benefits are also eligible for 401(k) benefits and vice versa. Payroll procedures. The plan sets the types of compensation eligible for 401(k) plan deferral withholdings. For example, the definition in a plan document may read, “all compensation reported for W-2 purposes.” In this case, all salaries, wages, bonuses and commissions would be eligible for 401(k) withholdings, while items such as moving expenses and deferred compensation would not. Errors can occur due to unclear wording. Depositing participant deferrals in a timely manner. The timely deposit of participant deferrals (and participant loan repayments) with the plan custodian is the most significant issue for independent auditors and the DOL. Provisions or guidelines for these transactions cannot be found in the plan document; the DOL has created regulations designed to protect participants of the plan from unauthorized use of their money by the plan sponsor. For many plan sponsors, controls over the plan are not often given substantive attention. Most sponsors feel that if an outside custodian and record keeper are employed, then there isn’t any opportunity for fraud or errors. Even with the best third-party administrators, there are plenty of opportunities for errors to occur if the sponsor doesn’t implement proper authorization and review of controls. Where there is lack of oversight, there is the opportunity to commit fraud. The final area that will be new on your first 401(k) plan audit will be financial reporting for the plan. The Form 5500 is filed for both small and large plans. However, once you are considered a large plan and require an audit, additional financial reporting is required. Audited financial statements, prepared in accordance with accounting principles generally accepted in the United States, are required to be attached to Form 5500 when filed. Hiring a plan auditor is considered an important fiduciary responsibility. When selecting an auditor for a first-year audit, it’s important to understand his or her expertise with benefit plan accounting. An experienced 401(k) plan auditor can help educate you on the reporting requirements and in the preparation of plan financial statements filed with Form 5500.